For-hire vehicles are spending much more time cruising without passengers in the Manhattan core since the arrival of Uber and other TNCs. A report published today by taxi savant Bruce Schaller pins Manhattan’s current traffic meltdown squarely on the relentless growth in Uber, Lyft, and other app-based for-hire vehicles. Schaller’s key finding is that for-hire vehicles in the Manhattan core are traveling greater distances and in greater numbers — and that a rising amount of this traffic occurs without a passenger in the vehicle. He proposes regulatory incentives aimed at modifying the companies’ algorithms that match drivers to customers, a step he says could markedly cut Manhattan traffic without resorting to surcharges or other traffic pricing to dampen demand. Data from the nearly half a million daily TNC fare trips in the five boroughs enabled Schaller to zero in on the 8.5-square mile Manhattan central business district, where worsening gridlock is expected to be the focus of a congestion pricing plan to be unveiled by Governor Cuomo in his January 3 “state of the state” address. On an average weekday, 15 percent more taxi/TNC trips beginning and/or ending in the CBD were made in June 2017 than June 2013. 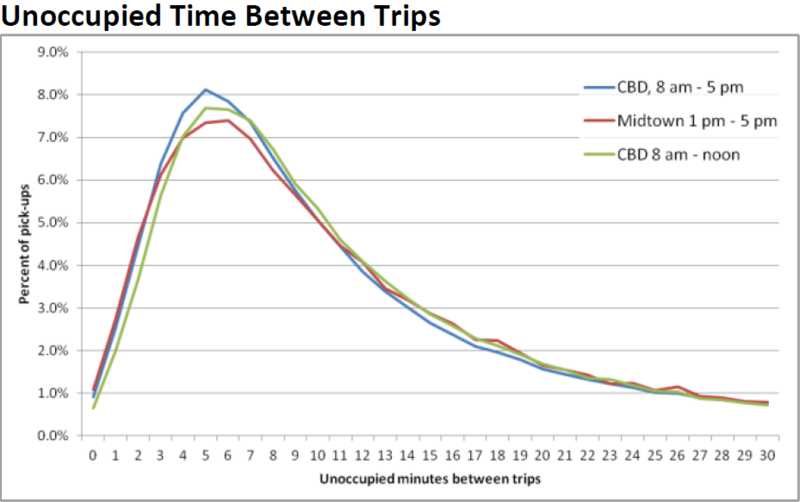 Combined taxi/TNC weekday mileage in the CBD grew by 36 percent, as mileage rose faster than trips due to both greater trip lengths and increased cruising — the percentage of mileage with no passengers. The number of taxi/TNC vehicles in the CBD increased more, by 59 percent, due to slower traffic speeds. Because of increased cruising, the number of unoccupied taxi/TNC vehicles increased by 81 percent. Taxis and TNCs together now account for 1.5 million miles of weekday mileage in the Manhattan core, according to Schaller, with taxis at just under 700,000 miles (a one-third decline in just four years) and TNCs just over 800,000. The combined figure gives for-hire vehicle 45 percent of all motor vehicle mileage in the central business district. Schaller puts the net rise in for-hire vehicle traffic in the CBD since 2013 at 378,000 miles per day. This increase is more than four times as great as the drop in mileage from declining automobile commuting into the CBD over the same period, by my calculations. It also amounts to 10-12 percent of current total mileage in the central business district, suggesting that growth in for-hire vehicle travel is the biggest cause by far of deteriorating travel speeds. The City or State could require that TNC companies reduce excessive unoccupied time by the vehicles dispatched by them. “Excessive” could be defined as the time greater than needed for driving to the pick-up location … [and could] be subject to a penalty (most likely financial). The objective of the penalty would be to strongly incentivize TNC companies to minimize the unoccupied time of their drivers. While Schaller would leave it to the companies to work out the mechanics, he cites a program called “rematch” that Uber and Lyft are employing at JFK and LaGuardia and other airports around the country. The companies’ dispatch systems, he says, “offer trips to drivers at airport terminals just as they drop off an arriving passenger,” which avoids drivers dead-heading to the waiting area several miles away while another driver of an unoccupied vehicle must go from the waiting area to the terminal. It’s not clear how rematch could work in Midtown’s chaotic street environment. Schaller appears to be counting on regulatory incentives spurring Uber, Lyft, and their competitors to devise the necessary algorithms. He also concedes that taxis, which operate primarily through street hails, would require a different mechanism, perhaps allocating each cab a set number of hours in which it could operate in the CBD. Taxis are less central to congestion in the Manhattan core, however, due to both their shrinking market share and the lesser amount of unoccupied time compared to TNCs. 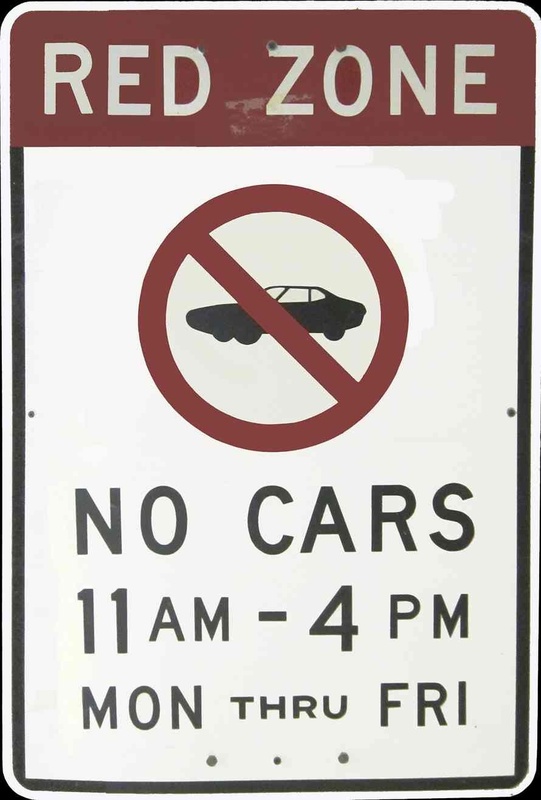 Nevertheless, Schaller estimates that “eliminating unnecessary occupied time between trips” by all for-hire vehicles could reduce total central business district traffic by 7 to 11 percent. He is less sanguine on the potential to cut congestion via for-hire vehicle surcharges, arguing that the low price-elasticity of taxi and TNC trips consigns surcharges to be revenue-raisers that would barely make a dent in traffic. It’s possible he is understating the price sensitivity of some for-hire trips as well as overlooking surcharge options pegged to each trip’s mileage and minutes within the CBD, rather than being set as a single, flat fee. Nevertheless, the new Schaller report makes a major contribution to understanding how Uber and other app-based ride services have exacerbated Manhattan traffic congestion. With Uber and Lyft continuing to increase relentlessly — I estimate that in the first three quarters of the year their daily trip volumes in the five boroughs rose each week by an average of 1,250 and 1,000, respectively — his analysis and recommendations merit wide attention. I’m come to believe that reducing Manhattan traffic is not possible, and that exempting buses, bikes, emergency vehicles (and subways) from traffic is the way to go. As for deliveries, eventually people would pay up to have these take place at night, because that would be cheaper. Emergency vehicles could use the bus and bike lanes, if these were kept clear. Especially if some of the first responders were deployed in smaller vehicles to get there first. Schaller does the right thing by ignoring the millions the cartel paid for each taxi medallion. The medallions are not carte blanche licenses to pick up people in the street allowing them to cause traffic. Yellow taxis SHOULD pay more fees and be treated exactly as Uber. They shouldn’t be allowed to travel in the CBD for too long; who cares what they paid for a medallion! I also think his points regarding empty cars are valid; one good idea is that yellow-cab drivers should wear shock collars if their cars are empty for too long, it shouldn’t be too difficult to implement through the TPEP system. That will surely fix the problem of empty cars. If TNC have been driving this congestion in the CBD, shouldnt dealing with them happen before asking outer borough NYC residents to pay more. One time I was trying to cross the street near Tompkins Square Park and noticed at least 20 TNC cars in a row go up Avenue A. The streets would not be as congested if they werent around. One major issue is black cars double parking while they wait for their fares to show up. At rush hour it’s like a slalom course for buses and cars to swerve around all of the black cars just sitting there. I have to blame the passengers as much as anyone. They can see when the car arrives on their phones, and it’s just sitting there taking up space while someone is kissing their pet turtle goodbye. Ridiculous. We absolutely need smaller, safer and more nimble emergency vehicles. It’s interesting how much bigger American ambulances are than European ones. A European Type C ambulance (mobile intensive care unit) is notably smaller than American ones. NYFD ambulances are like tanks. I don’t know how they expect to get around in our crowded city. I don’t know when the powers that be in the city will start to “think small” and understand how space constraints work. I think your opening sentence left out a key word: TNC’s are driving the *increase* in CBD congestion. The underying and easiest-to-fix cause is that 3/4 of private autos (those using E Riv bridges from LI/Bklyn/Queens and crossing 60th St from No. 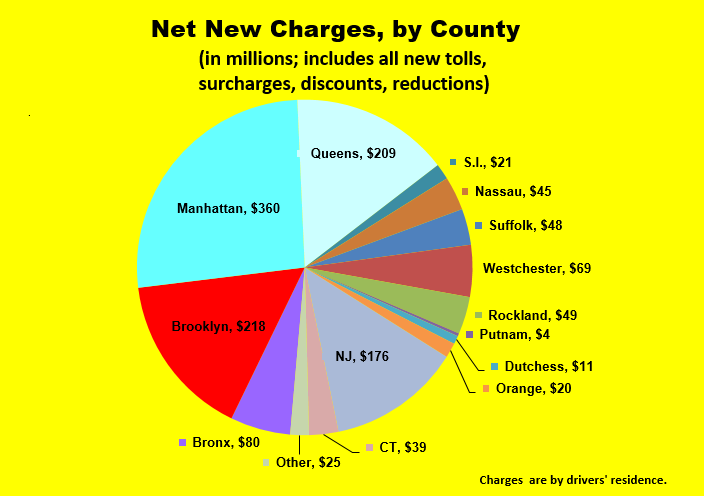 Manhattan / Bx / Wchester / CT pay no toll which incentivizes them to take too many car trips into the CBD. That’s why c.p. Also a big impact on urban design. Getting the fire trucks through is the reason for a lot of excess pavement, and a reason you can’t have pedestrian — only areas. Umbrian hill towns are wonderful place to be, but you could never build one in the U.S. Assisi has a large parking lot and bus station at the edge of town, right next to the police precinct, where you pay to leave your car. It has two streets for selected motor vehicles. Everything else is a pedestrian lane. I like the idea behind the unoccupied time penalty. I am concerned that in practice it will produce low or high tech hacks to avoid the penalty such as simply switching off a tracker, developing multiple TNC profiles/accounts, or medallion cabs coming in on TNC rides, then switching back and forth between street hails and app hails. Also, higher customer prices, which may be the net effect of financial penalties, are unlikely to sway demand, as Schaller states. You’re ducking the issue. By how much would the anticipated reduction in vehicle travel across the cordon reduce congestion within the CBD? 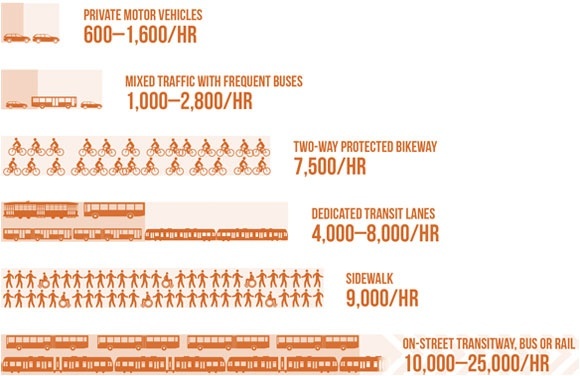 The Mayor’s mobility report indicates it hasn’t. As I noted there’s an 85% correlation between the cordon count and vehicle speed. Both have dropped in lock step. I suggested that other factors were more important than cordon flow as congestion drivers within the CBD. I’m glad that Schaller has found one smoking gun. I would have been happier, if he calculated the correlation over the 4 year period rather than simply showing a before and after comparison. If a cordon toll will not reduce CBD congestion, and the collected data indicates it will not, then its merits must rest on how efficient it is in raising money and how these monies will be spent. The Move-NY proposal is short on details for the latter and overestimates the former. The latter isn’t entirely Move-NY’s fault. The MTA has not been forthcoming on what is needed to fix the subway system. Move-NY has not stated how the monies would be divided between the MTA’s city and suburban public transit entities. 30 to 60 percent of the cars you see in NYC on city streets when they’re at their most congested are cars looking for parking. 5 to 6 minutes between trip seems like a great trade off when the streets are at their most congested. And if the city actually moved to capitalize on that reduced need for parking, those ‘parkingless’ trips could be transformed in space for additional residences or offices or gasp public transportation and pedestrian and bicyclist safety installations. What’s the rationale for continuing to insist that a cordon toll should be implemented? That’s the issue you are ducking. As Schaller noted and you quoted, current vehicle flow across the cordon hasn’t generated increased congestion within the CBD. Why continue the charade that this is a congestion tax? A cordon fee + FHV surcharge (w/i the CBD) together will shrink VMT enough to effectuate a double-digit rise in vehicle speeds — even if none of the revenue were invested in improving transit. Do you dispute that? That cordon entries continue to shrink slowly doesn’t preclude vehicle trips into the CBD from being a huge cause of traffic congestion. I don’t know what it is in your mental processing that keeps you from grasping that. I do know that it’s tiresome to have to rebut you on that score, time and again. Please get over it so we can have a more productive debate. Thanks. That leaves 55 percent for *all* other vehicles. Surely you are not suggesting all (plus an extra 5% phantom vehicles) have already arrived at their destination and are merely circling the block looking for street parking. Even at your low estimate of 30%, that would mean that the average car spends more time looking for parking than actually making the trip. Realistically, private cars make up a much smaller percentage of traffic in Manhattan than in any other American city. And while they may circle for parking a bit, the difficulty of finding parking means that short trips within southern Manhattan are done by transit or walking, or drivers have other arrangements for parking off-street. The percent of vehicles looking for street parking cannot be anywhere close to what you suggest. Higher prices may even attract more TNC drivers, who think they can “beat the odds”, making the overall problem worse. 28% in Prince street, SOHO (Daily average), 40% on Sat. To Shoup’s more methodical research. I’d be interested in studies you’ve read that indicate otherwise. But I’m not especially interested in debating the way your private, anecdotal observations contradict a fairly well established phenomena. I looked at the Shoup link, and he admits that “the data are selective because researchers study cruising only where they expect to find it”. Interestingly, the only rate for New York in Figure 1 is 8%. The 30% average in that figure is derived from a handful of cities dominated by a single outlier, Freiburg, with 74%. Shoup later mentions the SoHo study, which was based on *one* short, local street. A useful data point, but hardly generalizable to “NYC”. A similar measurement made on an avenue would likely show a much smaller fraction of drivers cruising for parking. Also, it’s not clear to me from the transalt link whether the interviews of drivers stopped at red lights properly represented taxi drivers. So, no research to back up your claim, just special pleading in support of your personal bias? It’s a free, open Internet full cranks and malcontents. You’re free to it. But I won’t be engaging you again. Special pleading, as opposed to what, your cherry-picking the result from one study of one street, inexplicably multiplying it by two, and then claiming it applies to NYC? I merely quoted the part of a source which *you* provided which acknowledges the limitations of such research, and then admittedly speculated a bit about what “researchers study cruising only where they expect to find it” means in practice in NYC in the context of the transalt study. But I think my guess that the cruising rate should be lower on avenues than on smaller streets is far from crazy.